Floral, full with a fresh salty tang. Superb wines poured by Rene Rostaing included the perfumed, finely balanced and restrained Cote Blonde contrasting with dark manly La Landonne. Domaine du Colombier Croze and Hermitage delivered well above their price. In the south loved meeting Jean-Michel Vache of Le Clos de Cazaux whose refined Vacqueyras I have long been a fan of. He makes the Wine Society’s Exhibition Vacqueras which is tremendous value. I have to admit that the massively concentrated, extracted & ‘over the top’ nature of most of the Chateauneuf du Papes nearly caused me to lose faith with this region. That was until I got to the marvellous, classic & refined wines of both Vieux Telegraphe and Cht Beaucastel. Wines made to last but with clean fruit and freshness. 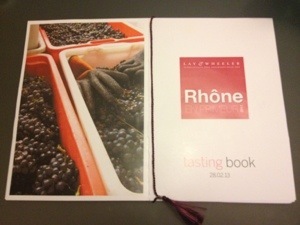 Categories: Everything else, news, tasting notes | Tags: France, rhone, syrah | Permalink.